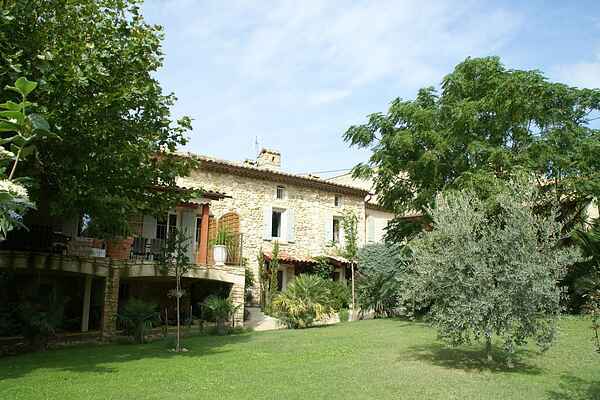 At Les Granges-Gontardes (1 km) you'll find this apartment on the first floor of the bastide. This house has a private terrace on the ground floor in front of the entrance of the appartment, On the property you find also other terraces, cosy sitting areas and a large pool to share with the other gite and the chambres d'hotes. The owners, with child and dog, live in the same building. There are plenty of activities in nearby areas. You can find shelter in the Grotte de Rochecourbière (14 km), a famous spot with plenty of local history. The same is true for the Château de Grignan (14 km). Immerse yourself into the renaissance. On Tuesdays there is a Provencal market in Grignan. You'll find the Roman church of Saint Michel in the artists' village of La Garde-Adhémar (5 km). Very beautiful! Make a special outing to Soyans, where you'll find a museum about eggs and nests. Thousands are displayed here. The glass factories of Dieulefit (40 km) are also very interesting for both young and old. In Le Poët-Laval (36 km) you can admire a gorgeous 12th century castle.